Spouting Horn, site of one of the major hiking trails on Kauai. Hiking the trails on Kauai can be an exciting way to explore the island. Kauai has many beautiful mountain and coastal trails. But some also have important cultural and historical meaning. Here are a few of the best historic trails on Kauai. The 10-mile Koloa Heritage Trail passes through many of the most interesting historic locations on Kauai. Among its major stops are famous places. 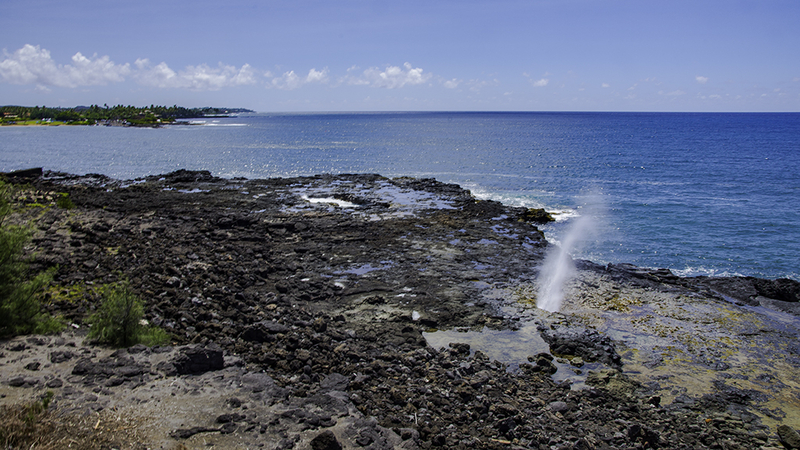 For example, Spouting Horn is one of Hawaii’s most famous blowholes and played a role in ancient Hawaiians legends. Koloa Landing was once the only port of entry for foreign imports and Hawaii’s third largest whaling harbor. While the Hawaiians dedicated Kihahouna Heiau along the trail to a number of Hawaiian gods. Hikers trekking through the Koloa Heritage Trail can also explore the celebrated beauty of Poipu Beach. The trail passes Makawehi and Pa’a Dunes. Here, you also can find hundreds of bird and plant fossils in limestone rocks. There is also Ha’upu Ridge where volcanic formations showcase Hawaii’s geologic past. The Koloa Heritage Trail passes a grass hut where the beloved Prince Jonah Kuhio Kalanianaole was born in 1871. From this humble beginning, he grew to become an heir to the Kingdom of Hawaii. He also went on to serve as Hawaii’s Congressional delegate for 20 years. The trail also passes through Keoneloa Bay. This is a former fishing camp where researchers have found tools and religious artifacts. Here, between 200 and 600 AD, Polynesian settlers made some of the earliest arrivals into Hawaii. The trail winds past the Koloa Missionary Church, Koloa Jodo Mission and Yamamoto Store. Japanese immigrants built these historic structures during the 19th century. The nearby Koloa Plantation, established in the 1830s, was the first sugar mill in Hawaii to export sugar cane. Here, immigrants from Japan, Germany, Portugal, the Philippines and China lived and worked for the plantation. Along Kauai’s southern shores, the Maha’ulepu Trail is an important part of Kauai’s heritage. This is a fantastic way to experience some of Kauai’s last remaining undeveloped coastline. Additionally, hikers will enjoy views of Shipwreck Beach, sand dunes, sea cliffs, sea turtles and monk seals. The total distance of the path is about 2 miles over flat ground. 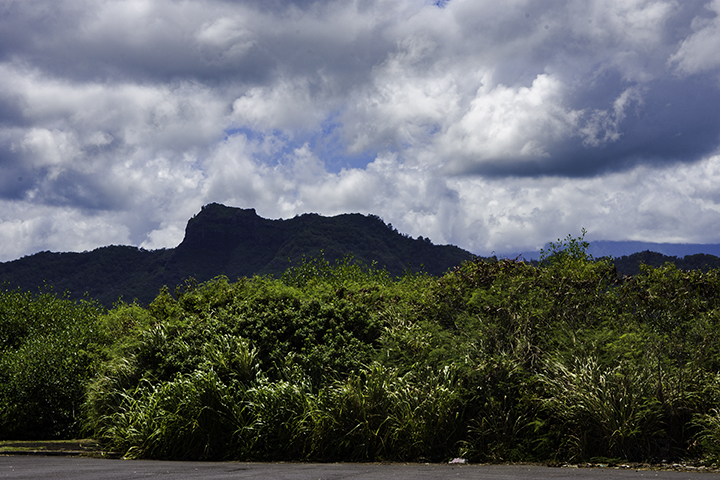 View of the Sleeping Giant on Kauai. Between the towns of Wailua and Kapa’a, is the Nounou Trail. People often refer to it as the Sleeping Giant Trail because it passes through a mountain with the same nickname. From a distance, the mountain has the shape of a giant lying down on its back. This trail offers beautiful scenery and a pleasantly cool hike. Cook and Norfolk pine groves planted by the Civilian Conservation Corps in the 1930s offer the shade. About a quarter of a mile into the walk, veering left, will give also you views of the eastern coastline. The hike is moderately challenging, up hilly terrain and alongside ridges. It affords visitors with glimpses of the wildlife and forests of the surrounding area.